This coming Monday sees the Ohashi Gym stable of fighters returning to the ring for the next in the long line of the "Phoenix Battle" series. The show, the 49th in series of shows, is headlined by a Japanese Featherweight title fighter between Satoshi Hosono and Gosuke Seki though they are far from the only two fighters of note on the shots. 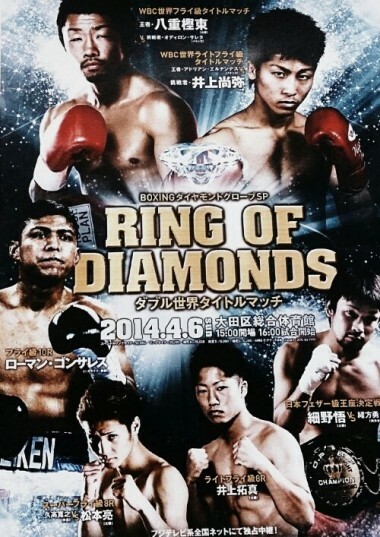 The card also includes the highly touted Super Flyweight prospect Ryo Matsumoto and the OPBF Minimumweight champion Ryuji Hara, though neither of these two are really featured on the poster which is a shame considering that they are emerging names and faces in the sport. Although many of the bouts are one sided the show is pretty interesting overall, even if it is just so we can see the development of some of Ohashi's "other" top prospects. We'll admit we do think Matsumoto will go a very long if given the right fights to develop as far Hara the jury is out, he's already claimed Japanese and OPBF titles but long term we feel there is a lot to do before he moves on to a world title fight. Ignoring the fact that the prospects aren't featured on the poster we'll admit we like the poster with the main event fighters and the lion's headwhich gives the feeling of danger. It's not spectacular, and it is flawed, but we still like it.